Every Spring I sort through my clothes for donate and consign candidates. The Spring Cleaning coordinates well with Herberger’s Goodwill Sale (Herberger’s is a Midwest department store under the Bon-Ton umbrella) as every donation garners a 20% coupon for the Spring sale event. After many years of doing this, I can report that the clothes collection is finally down to a manageable size; manageable is defined as ‘fits in all closets and drawers with nothing in tubs on highest shelf in garage’. This year I rediscovered three Issey Miyake blouses made from V2056. V2056 is from 1984/1985, one of the first Miyake patterns. 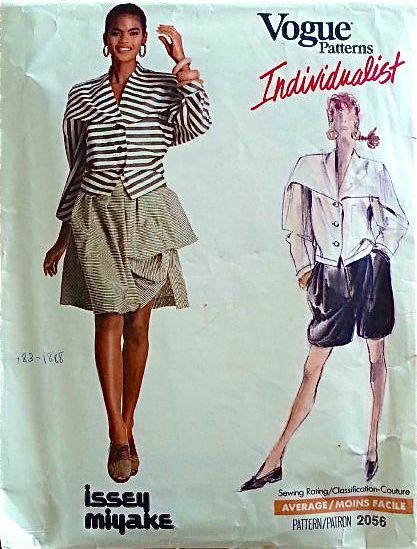 In 1984, Vogue launched ‘Individualist’ patterns and Issey Miyake was a part of this designer group. 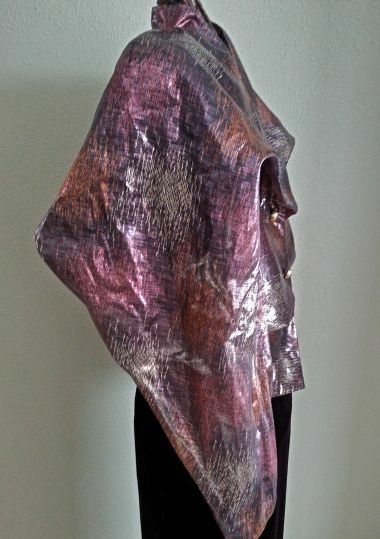 I was immediately taken with the Issey designs and have a large selection. 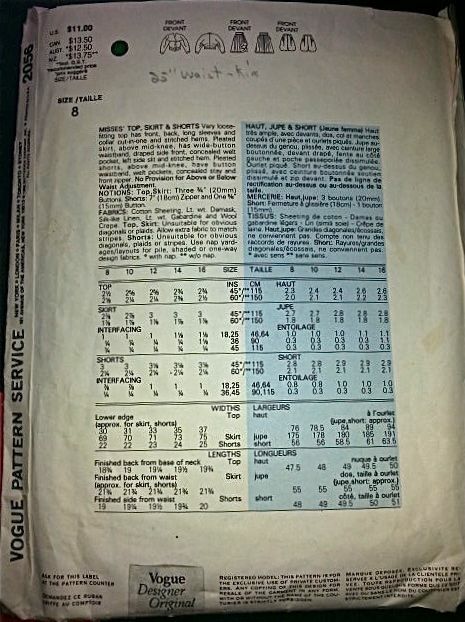 The Individualist patterns are now highly prized and sold on Etsy, eBay, vintage patterns sites, etc. Googling ‘Issey Miyake Vogue Patterns‘ brings up images of all the patterns mixed in with Issey’s couture and RTW. 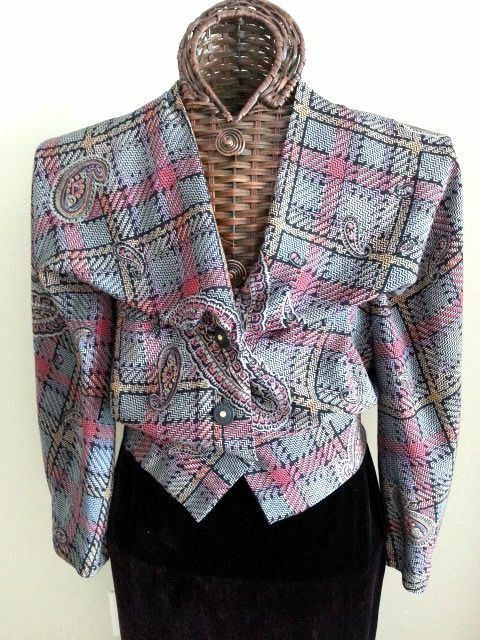 Another site is Miyake Maniacs with photos of all Miyake Vogue patterns published through 2000. Unfortunately, the site is inundated with pop-ups and the promised ability to access pattern number and date is not available. 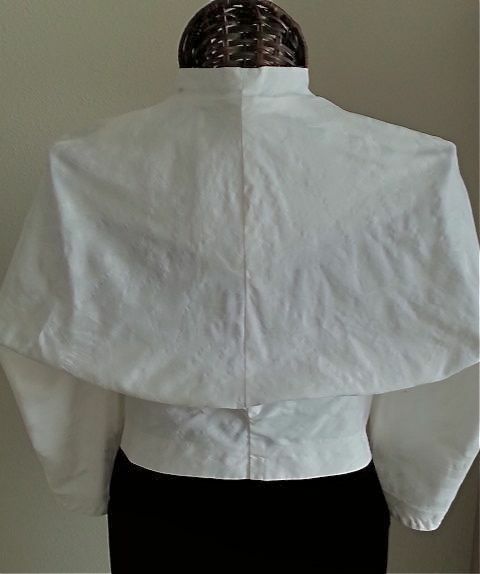 The first version was made in 1985 for my daughter–see the 25″ waist note above; not quite Scarlet O’Hara measurement but more reasonable and no corset enhancement! The dressform doesn’t even have that small a waist circumference so the bottom button is open on photo below. 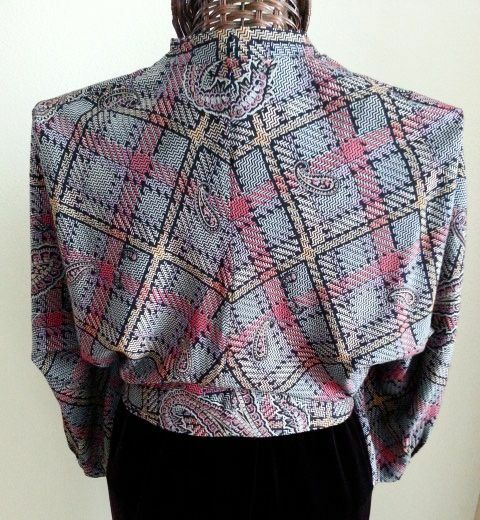 Another note about the dressform: the shoulders are broad but this pattern and 1985 is suitable for shoulder pads. 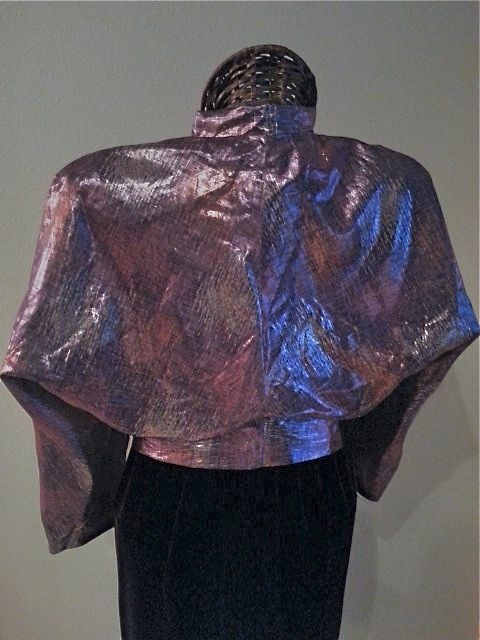 In fact, the lamé blouse does have soft shoulder pads. 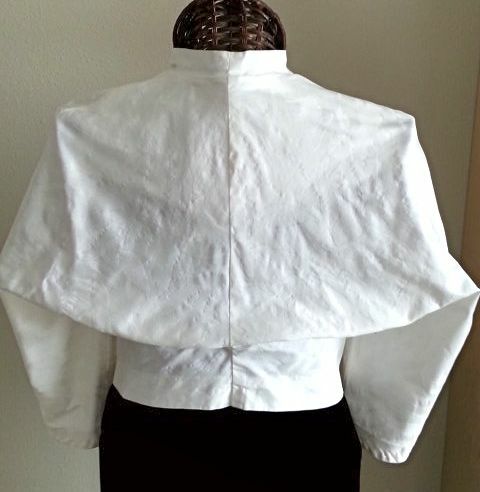 The blouse only has three pieces; cut two of #1. CF has attached facing and is on crossgrain; CB is on bias hence the interesting back view. Have no clue how/if this could be altered; I avoided the issue by buying two patterns in needed sizes. The other pattern pieces are for the skirt and shorts. Made the skirt out of a Leiter’s Designer Fabric (out of business) with a woven-in plaid (sorry, garment no longer available); worked well even though plaids are not recommended. The shorts pattern is back in style and reminds me of Peter Pilott0 2014 collection, especially some shorts from the Target collection. The blouse above is a hefty cotton damask, also from Leiter’s Designer Fabrics. Unfortunately, photographing it is a challenge above and beyond my limited editing skills. It looks like a wrinkled mess but, trust me, it looks just fine in real time. Due to the complicated construction, this is a difficult piece to iron. The next version was made for myself out of a rayon challis with a coordinating print as a scarf. Here you can see the interesting bias centerback. 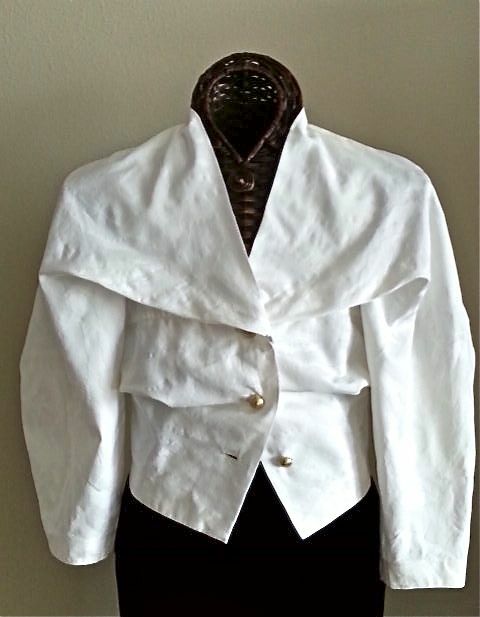 The challis drapes beautifully and can even be worn under a loose jacket. 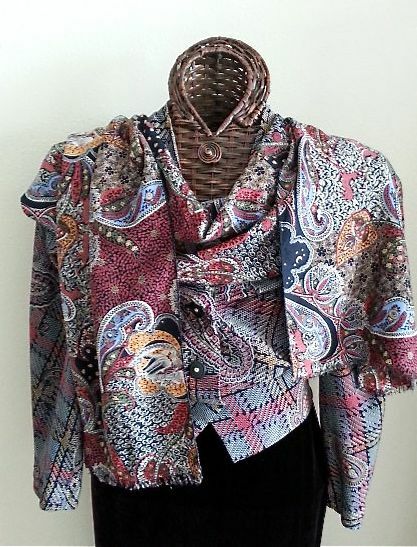 Please be amazed at the matched paisley motif at CB neck; I know I am! The final version is in a lamé that is quite crisp but also works well. A fashion note: the full sleeves disguise a sway back (which I have) and the high-hip length does not emphasize a full-hip figure. Now that I review this pattern, believe I have a knit in my stash that would work beautifully. Would like to hear from other “Miyake Maniacs”, especially if you have sewn this particular pattern. 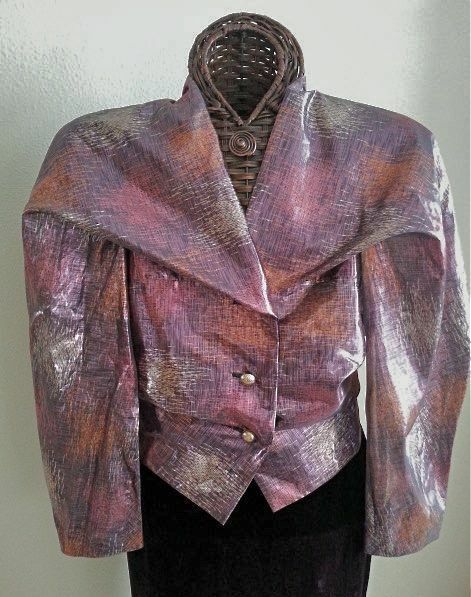 This entry was posted in FIBER FASHION FUN and tagged Hergerger's, Individualist, Issey Miyake, Leiter's Designer Fabrics, Miyake Maniacs, V2056, Vogue. Bookmark the permalink.